Alice Pung: "Starvation diets were every day memories." Hunger, brutality and filth: Inside Pol Pot's unnerving social experiment. In a new book On Happiness: New Ideas for the Twenty-First Century, Alice Pung writes on the hope that we can muster when we suffer a catastrophe. ‘Doctor, I ate one of those creatures’, my grandmother blurted out one day at our doctor’s office in suburban Melbourne, pointing to a chiropractic poster on the wall, ‘We ate them when we were starving’. Granny was in her eighties at this time, a survivor of revolution in China and then the Killing Fields of Cambodia. Her mind was still as sharp as a digital photograph, but her eyesight was not as clear as it once was. My father, aunty and I looked at the chart, alarmed and embarrassed. ‘Mother, that’s a spine!’ laughed my aunty. ‘Huh? But we ate creatures that looked exactly like that’, my grandmother protested. ‘That’s a picture of a human spine on its side’, explained my father, ‘What you’re thinking of are centipedes’. ‘Yes. That’s right, centipedes’, mused my aunty, ‘Come to think of it, they do look a lot like that picture up there on your wall, doctor’. I waited for what usually happened when granny made such admissions. I waited for her to list to our good doctor all the things they ate while they were starving: crickets, scorpions, rodents, even my father’s leather belt, which they cut into small pieces and boiled for hours on end in secret, to tenderise it. I waited for them to laugh about all this – this secret joke of shared experience – while the doctor and I watched in wonder. Like Debrief Daily on Facebook. I had always known that my father survived the Killing Fields of Cambodia. I’d grown up with adults around me talking incessantly of the Black Bandits, which is what they called their captors, the Khmer Rouge soldiers who dressed in black, because colour was banned. I knew how this story ended, because it always ended on a good note. What five-year-old could fail to be enamoured of a story that culminated in her own birth? Manufactured in a Thai refugee camp, but assembled in Australia with Chinese parts, I was named Alice after the Alice in Wonderland, because my father thought this country was one. My parents taught me not to cry when I had to get immunisations, not through fear or the promise of lollies, but through their own stoicism. They talked about human backbone and starvation diets as if they were everyday memories – for them, these things were just as ordinary as remembering the 1977 Rugby World Cup, finding out about Elvis’ death or listening to ABBA songs were for everyday Australians during that time. They never spoke about their experiences to shock strangers or endear themselves to sympathetic ears. They never spoke about them to anyone outside our family unless asked, or if my grandmother blurted revelations out at doctors’ offices. ‘Remember Needle?’ my mother might say to my father over dinner one evening, ‘Remember how talented she was with a sewing machine? She could just look at an outfit and then go to the New Market, find the cloth, and copy it exactly’. ‘Too bad she was smashed’, my father would say, and they would both sigh and continue eating dinner. Yet my father did not seem to be burdened by his past. He didn’t understand what post-traumatic stress disorder was, or survivor’s guilt. Those were feelings for people who had time to feel feelings instead of getting down to work and making the most of this miraculous new life, this life after seeing death so close. So he named me Alice, and then the rest of my siblings followed suit with the first letter of the alphabet: Alexander, Alison, Alina. When cousins started to arrive from overseas or were born here, they too were given ‘A’ names: Angelina, Angel, Anderson, Amanda, Amara. It didn’t matter what part of Asia or Southeast Asia they had come from, they too were going to fulfil this narrative of new beginnings. My father bought me watercolours and charcoals from a real artists’ supply store, not children’s crayolas and textas. He wanted me to make art in my life, not just scribbles. He also made us toys. He knew how to make Clag, play dough, and apples out of balloons. He taught me how to do calligraphy. For too long, his life had been bereft of culture and art. But my favourite toy was the egg roly poly. He would hollow out a raw egg, fill it halfway with wax, and draw a face on it with a pen. Every time you knocked the roly poly over, it would sway from side to side before standing back upright. You could never knock it down unless you smashed it. It reminded me of my father’s resilience. So when I began writing my book about my father six years ago, I understood the gravitas of the task of interviewing him about his experiences in Cambodia. 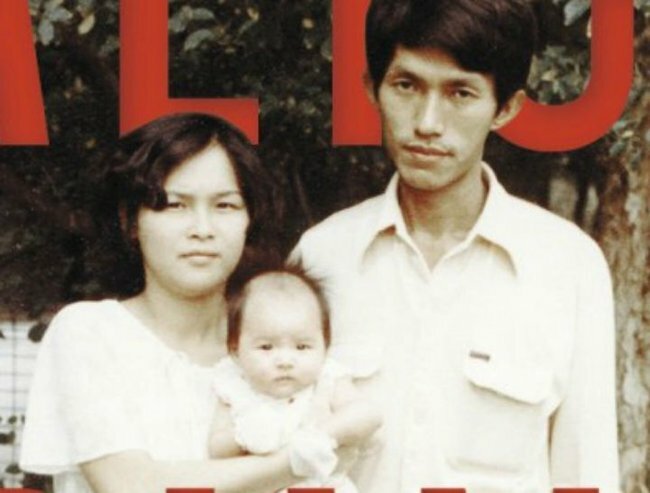 Phung&apos;s book: &apos;Her father&apos;s daughter. He had survived one of the most far-reaching experiments in social engineering of the last century, Pol Pot’s Year Zero, a regime as literal as it sounds. Pol Pot named himself after the phrase ‘Political Potential’ and he decided that in order to implement a pure Marxist regime and efface all traces of the traitorous modern world, he had to drag time back to Year Zero. The French had attempted a similar thing, calling the first day of their new post-revolutionary regime in 1789 Year One; Pol Pot took it one step further. His regime banned laughter and smiling. It banned crying too. Everyone wore black. Music was also banned. Hospitals did not exist. Modern medicine did not exist. Technology did not exist – no running water, no electricity, not even soap or toothbrushes. The only permissible personal property was an individual spoon. People were shot simply for knowing a foreign language or wearing glasses. All the things that we think make for a happy – interest in the larger world, medical and scientific advances, free expression of our feelings – were executable offences. ‘To spare you is no profit, to destroy you is no loss’ was the motto of the regime. I had talked to psychologists and academics about genocide survivors, consulted with older Jewish friends, studied up on the ethics and sensitivities of approaching victims, read every study of the Cambodian genocide that I could find. If I was going to write a book about a survivor, I wanted to do it the right way. But most of my father’s stories I already knew from dinner discussions and having grown up with aunties, uncles and friends who were also survivors. ‘There was a truck that drove by, with bodies for burial stacked on top of each other behind the wire grating’, my father’s colleague would say at lunchtime at the Retravision store where we all worked, ‘And as the truck passed me, I could see that some of the limbs were still moving’. And then another person would tell us that in their camp the soldiers would cut open people’s stomachs while they were still alive, to see if they had been stealing rice. And half an hour later, back to work we would go. We’d stand on the shop floor smiling, selling whitegoods and browngoods and mobile phones to customers, happily explaining the marvels of modern technology to those who mostly took these things for granted. The stories of great horror my father told me did not entirely surprise me. By then I’d also read almost every single memoir about surviving the Killing Fields that had been translated into English, from Haing S Ngor’s autobiography to Bizot’s The Gate, as well as the works of David Chandler and Ben Kiernan. Yet the one moment that took me by most surprise was when my father suddenly told me, ‘There were some happy moments too’. ‘What do you mean happy moments?’ I asked. ‘Well, you know, when I got promoted to the fertiliser team’. One evening my father had been dragged out of his hut by two soldiers with guns. He realised it was probably going to be his end, in the dark of the night, without being able to say goodbye to his mother or sister. He was taken to the unit commander’s hut. ‘You can do acupuncture, is that true?’ the soldiers yelled at him. My father didn’t know whether he should confess or stay quiet – either way, he would be smashed. He had found some electrical wires, stripped the plastic covering from them and sharpened the copper tips to a fine point. This was how he secretly practiced acupuncture and treated the sick. ‘Yes’, he confessed to the soldiers, ‘I do acupuncture’. They pointed to the unit commander who was writhing about in bed with terrible stomach pains. ‘Get your needles out’, they commanded him. The next day, the commander was sitting up in bed eating rice porridge, and he gave my father a promotion. Instead of working in the fields, my father got the easiest job in the collective, which was to collect and make fertiliser with human excrement. ‘We sang songs’, my father reminisced, ‘I was surrounded by all these beautiful women.’ Only the women the soldiers found most endearing were sent to this unit so that they would not have to toil in the sun. ‘We sang when no soldiers were around’. My father returned to Cambodia and saw one of his ‘sisters’ from the fertiliser team again. By then she was a grandmother in an enormous, double-storey gated house with a polished wooden ceiling. They had not seen each other in thirty years. She was rotund and regal. My father told me, ‘This lady used to be a real beauty when she was young. She had the voice of a songbird, too’. It sounded like something you would say about your friend who had a former career as a model or small screen actress, not your fellow slave worker who mixed human excrement with you day in and day out while you all starved. My father also told me about the day his collective of thousands of people received a tin of Nestle sweetened condensed milk. In the medieval hell that was Pol Pot’s Cambodia, that tin of sweetened condensed milk was a solitary ambassador of the modern world. One 395ml tin mixed into an enormous one hundred litre black pot, with all those vassal-faced, black clothed, starving men and women looking on, slackened jaws and hungry eyes, as the pot was stirred, holding out their bowls and spoons in anticipation and excitement. Then there was the day when my father thought he saw the work of the Buddha. One day while toiling in the fields, he watched a bird peck at a pond of water – more a puddle, really – and emerge with what looked like a fish in its mouth. As the bird flew off, the fish fell back onto the earth, and my father collected it. That day was also granny’s birthday. In my ignorance, I had not realised that a human being who has been starved and enslaved for four years might not have lasted that long but for hope. Happiness seemed to be an act of defiance against hopelessness. My father’s motto was &apos;Never look back on what was lost, always face forwards&apos;. He got angry when one of his homesick friends told him, ‘Our bodies are in Australia, but our heads and hearts are turned towards China’. No, he insisted, you can’t think this way. Such ingratitude! Happiness was to always be thankful for small and large miracles. There is a character in Ha Jin’s novel A Free Life, in which the wife of the writer-protagonist says that her idea of happiness would be for one day to pass into the next, and be the same as the last. And for a while, for my parents, happiness was the same as comfort. They marvelled over running hot tap-water, indoor plumbing, occupational health and safety laws, traffic lights, escalators, McDonalds stores, Nescafe. They stocked up on tins of their precious Nestle sweetened condensed milk. They marvelled over the clothes they received from the Brotherhood of St Lawrence, they ‘wahh’ed over monuments like the Shrine of Remembrance and the Arts Centre. They fell in love with each other again and with this new country. One of my friends once told me, ‘That kind of love doesn’t sound like falling in love. That sounds like falling in relief’. My parents fell blissfully into relief. When I was twenty-five, I went on my first silent Buddhist retreat. We surrendered our phones at the door, were not allowed to talk to one another for the whole five days, and had to be very mindful of our every action. We woke up at five in the morning – and sometimes, four-thirty – did yoga exercises, cleaned out the retreat centre, sat meditating for hours crossed-legged or in full lotus position, cooked our own meals, cleaned the windows and floors. If we fell asleep during our meditation, a monk would hit us on the back with a large stick. So we had to concentrate. At times I had to stand up to meditate because I was so tired. ‘Are you mad?’ laughed my father when I came back, ‘You voluntarily gave up freedom of speech and movement and spent five days under the threat of the whacking stick? Sounds a bit like the Khmer Rouge to me’. Buddha himself said, ‘We are what we think. All that we are arises with our thoughts. With our thoughts we make the world’. Each noble truth has at its heart the concept of dukkha, which means ‘suffering’ or ‘unsatisfactoriness’ in Pali. Put another way, Buddhists believe that suffering is inevitable. Anything that is not permanent, that is subject to change, is dukkha. Thus, happiness contains within it the seeds of dukkha. Great success, which fades with the passing of time, is also dukkha. Western Buddhists don’t like this focus on dukkha, just as Western psychology does not like to focus on negativity. In this new, developed, comfortable and secure world in which my parents brought me up, it appears that we are trying to eliminate all traces of suffering. Some have even gone to the opposite extreme in conceptualising Buddhism, to position the Noble Truths more positively: There is Happiness. There is a cause of Happiness. There is a way of Happiness. There is a path to Happiness. Yet this focus on attaining happiness seems a more elusive and nebulous quest. After all, everyone knows what suffering is. It is universal and something we can all identify in ourselves and others. Yet how do we identify or qualify happiness? The Khmer Rouge banned religion and killed monks. They took the Buddha’s four noble truths and reduced them to two, and of those first two noble truths, they stretched them to their perverse literal extremes, so that they would snap back and slap you in the face. All life is suffering. YOU are the cause of the suffering. You must be punished with more suffering. The Khmer Rouge regime banned unauthorised feeling. Now that we can feel all we want, we are no longer content with small joys – the comfort that every day may unwind like the last – but we must have our large excitements. The idea that happiness is tantamount to excitement is the crux of all consumerist advertisements: Riveting new do-it-yourself home hair-dye colours. A car that will change your life. Swimming with sharks at the aquarium. Even cruise ships for wealthy geriatric retirees are premised on the idea of seeing the Amalfi Coast as never before, or finding something novel in an oft-visited place. Do new memories need to be made constantly, like a factory production quota, in order for us to be ‘surprised by joy’? My father’s Retravision business grew larger and larger, especially in the economic boom of the ’90s. Suddenly, my mother found herself smack bang in the middle of the suburbs in a massive house. What a house. They had spent one and a half decades working for this. No longer was waste left in a cesspit for my father to collect, now we could think which one of our four toilets to use. No longer did they live in the dark, sleep hundreds-and-thousands-to-a-thatched-roof; but with the flick of a switch could have a light on at all times of the night until daybreak. No longer did they have to grow or forage for every piece of food that entered their mouths, we had modern miracles like microwaves and fruit extractors. We even had a machine that cut cling wrap for us on a heated strand of metal wire. The meaning of human existence was no longer condensed and confined to the length of a starving man’s digestive tract, but expanded to his comfort, his ease, his rest. Upstairs we had a leather chair that, when you flicked a switch, would shiatsu-massage your limbs and lumber spine, downstairs we had a fridge that made ice on demand. Yet the more affluent my parents became, the more paranoias they entertained. When I was in primary school, they used to let me catch the bus by myself to do grocery shopping in the next suburb. Now, my younger sisters were driven everywhere. We lived in what was probably the safest cul-de-sac in the state, but that did not assuage their fears. They had never had it so safe, and yet they felt constant external threats to their safety. My father took to reading Andrew Bolt, my mother took to wandering the shopping centre to line our lives with new bath soaps and fleecy towels. My parents’ fears were not only post- traumatic war-related ones, I realised. It was also that now the more they had, the more they felt they had to lose. Fear, according to Buddhists, is the root of the other negative states of mind, like envy, and arrogance and hatred. Reduce your fear, and you reduce the amount you covet your neighbour’s things, your pride and your strong feelings towards your enemies. You also reduce your need to cling onto things, or hoard, or read fear-cultivating newspaper columnists. ‘It is not power that corrupts but fear’, wrote Aung San Suu Kyi in Freedom From Fear, ‘Fear of losing power corrupts those who wield it and fear of the scourge of power corrupts those who are subject to it’. There is a German word, weltschmerz, which means sorrow that one feels and accepts as one’s necessary portion in life. In that Buddhist retreat, I learned that life is only as long or as short as your next breath. The four noble truths are called noble, not unpleasant, or intolerable or awful. Eliminate all traces of suffering and you eliminate what it means to be human. I remember inviting my father to speak to some of my students at college ten years ago, when I was a political science tutor. He demonstrated on a student how a ten-year-old girl’s hands were tied behind her back by the Khmer Rouge, and how they flopped uselessly when the binds were finally released. He talked about performing the acupuncture that restored her hands again, matter-of-factly, not meaning to take any life-saving credit. My father shrugged. This was as honest as he could come to answering his own question of suffering: ‘You just get through it. Your family might still be alive’. ‘It is incredible’, my student later told me, ‘how a man like that is walking around in ordinary life’. Suddenly, I saw exactly what he meant. I realised I had been living with someone who survived, an extraordinary person in every day of my everyday life. Yet I knew that the real miracle wasn’t the survival. The real miracle was that he could still see the extra in the ordinary, and find happiness in small things. The real miracle was that he could still love. This is an edited extract of Alice Pung’s essay from a new book, On Happiness: New Ideas for the Twenty-First Century published by UWAP.